Heydar Radjavi was born and raised in Tabriz, Iran and did not leave that city until he was admitted to the University of Teheran in 1953. He was in love with modern Persian literature and dreamed of being a writer until he switched to mathematics at the end of high school (but that is another story). He was sent to the University of Minnesota, where he got his doctorate in 1962. 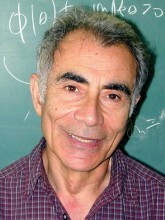 He then taught in Iranian, American, and Canadian universities until he moved permanently to Canada in 1972. He now resides in Waterloo, Ontario, with his wife Ursula. He has published books and articles in mathematical journals, and has been known to most of his friends and acquaintances as a mathematician. This collection French Hats in Iran constitutes his first publication outside mathematics in 55 years.